Well, it's Friday and time for my next optical illusion rendered in Excel. Don't believe it? Go ahead and download the Excel 2007 workbook. I'll have another next Friday! This optical illusion has always been my favorite (I originally saw it with a different object casting the shadow, but the effect was exactly the same). When I first saw it several years ago, I made a print out of it along with a separate strip of paper, long enough to span both squares A and B, and colored with those square's common color (so I could prove both squares were filled with the same color afterwards) and showed it to all my friends and colleagues. That the squares could be so close together and yet "look" so different in color absolutely flabbergasted me back then and still does today. I agree that this particular illusion is one of the best and one of my favorites. Hope to hear from you more. This page contains a single entry by Daniel Ferry published on February 26, 2010 11:50 AM. 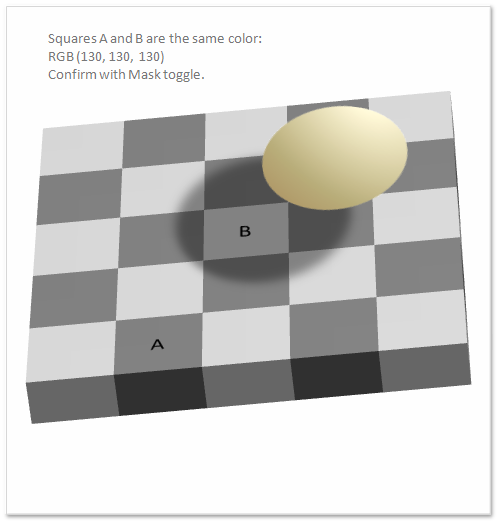 Chess Viewer Update was the previous entry in this blog. Dow Jones Volatility Chart is the next entry in this blog.